Our dedicated research governance team supports researchers in developing high quality research proposals. The team is responsible for managing the Trust’s research portfolio and also the Trust’s research performance. It works closely in collaboration with King’s College London and healthcare and academic institutions from the UK and internationally. We can advise on all aspects of research governance, including regulatory compliance, for trials in set up and also for active trials. Contact our team to help you get your research up and running. Please contact Jen Boston, Research and Development Governance Manager. Our research governance is supported by our corporate governance structure, which comprises the BRC Board of Directors, External Scientific Advisory Board and the CRF Review Board. It is a legal requirement to have a contract known as a Material Transfer Agreement (MTA), for the transfer of human material between institutions. We have historically used a King’s Health Partners (KHP) template MTA for this. To improve efficiency and reduce timelines, a new MTA Information Form has been introduced to replace the KHP MTA for the transfer of material between Guy’s and ST Thomas’s NHS Foundation Trust (GSTFT), King’s College London (KCL), King’s College Hospital NHS Foundation Trust (KCH) and/or South London and Maudsley NHS Foundation Trust (SLaM). The MTA Information Form is subject to the agreed terms of the Memorandum of Understanding signed by the KHP members on 27th October 2017. 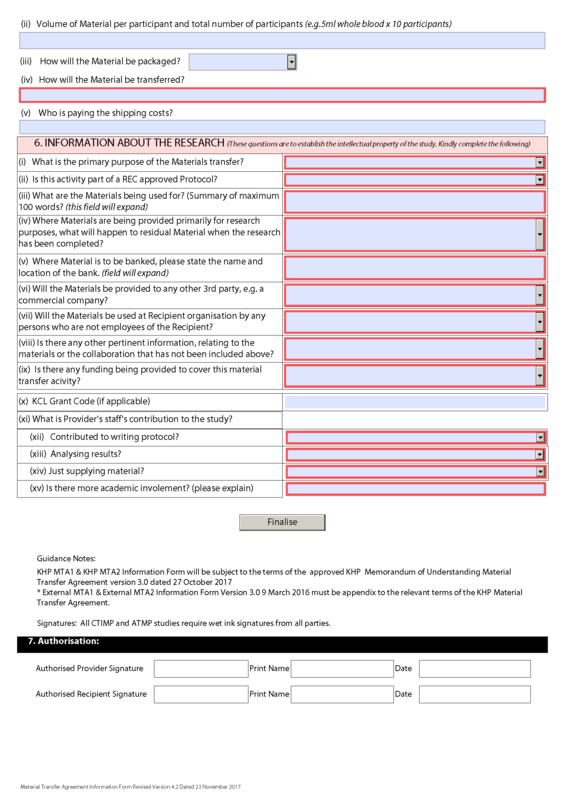 This MTA Information Form is initially completed by the Governance Officer at the institution where the material is being sent from (populating the blue fields) and then transferred to the Research Team for completion of the pink fields. The updated MTA Information Form should then be returned to the original Governance Officer for finalisation by the applicable contracts team. An extract of the new MTA Information Form can be accessed here. If you have any questions regarding the new MTA process, or to obtain a copy of the new MTA Information Form please contact the R&D Governance Team. A process map outlining the MTA pathway is below. The Health Research Authority (HRA) worked with the NHS R&D Forum to create a short animation to explain HRA Approval and to illustrate the experience of researchers applying for approvals before and after its development. The animation is designed for anyone with an interest or involvement in research in the NHS in England. It explains the HRA Approval’s role in simplifying the approval process. It gives an accessible overview of what HRA Approval is and that it provides a single assurance that studies are safe, legal and ethical – contributing to making the UK a great place to do research.